12:25 one reason I took the trade early is that my down Fractal of Pi "fractured"
11:08 resistance at 1839.75 stopped the rally; now watching for a decline as per +Tide. 11:04 on the SRT chart on the AUX page early support was 36.5. It was broken, then re-established. 10:30 The hedge fund computers add a lot of high frequency chop with moves under 10 minutes. 10:00 at this point I know my first trade did not work; that happens. I can't change the past. 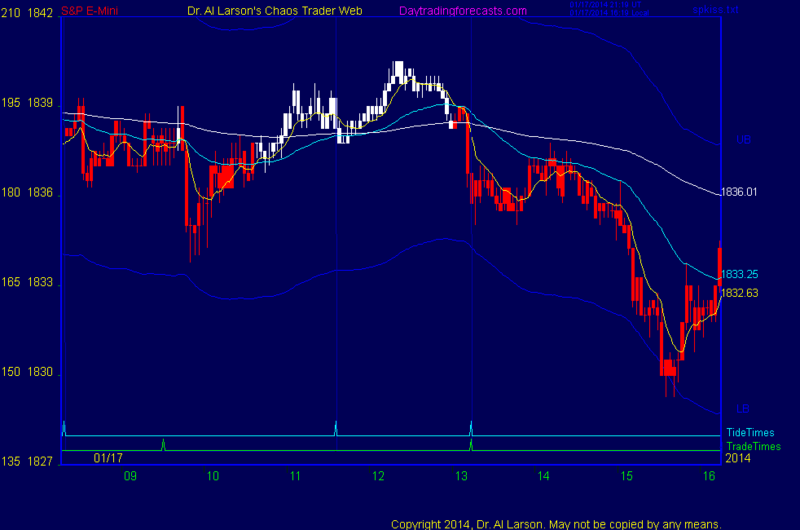 So now I need to keep my poise and wait for the next trade time, rather than over trade. trade times are 9:31 and 13:14. The first may be problematic given yesterday's lack of direction. 1/17/2014 7:37:39 AM MT bjf:: Good morning Al. Many thanks for these Friday clinics. I have followed you since way way back. Great work. 1/17/2014 7:32:37 AM MT MRL:: Good Morning!